Though sriracha and other hot sauces are loved by many— often times they contain undesirable ingredients, such as sugar and salt. Though, not to many people are dosing their food in tablespoons of hot sauce (at least I hope not), here’s a sriracha-style roasted brussels sprouts recipe that uses no hot sauce or sriracha at all. It’s flavorful, smokey, and a little more mild than hot sauce. Give it a try! Either, preheat the oven to 400F or prepare the brussels sprouts on a skillet. Wash the brussels sprouts. Remove the stems and then cut the sprouts in half. In a bowl, combine 1/4 cup of vegetable broth with the balsamic, lime juice, and spices. Mix and then pour over the brussel sprouts in a baking sheet with edges or in a skillet. If roasting the brussels sprouts, place the sprouts in the oven in roast for 20-30 minutes. Stir often to avoid burning. Add additional veggie broth as needed. 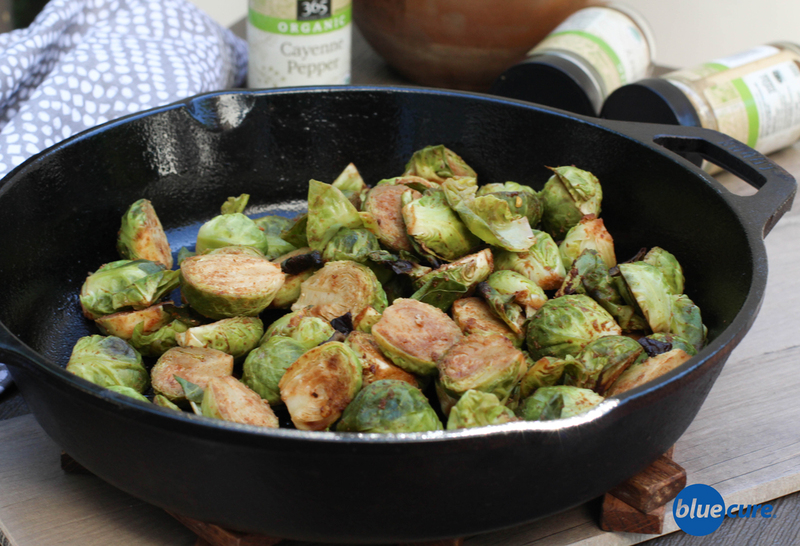 If sautéing, add the sprouts to a skillet and sauté until desired texture. Add more veggie broth as needed. Add more paprika or crushed red pepper as needed to make it spicier. *Sautéed onions and tempeh bacon would go fabulous in this dish too.